I was sitting in the back yard last Saturday afternoon, in the doldrums of summer, when something fell from the tree above me. It was a baby robin, and it bounced off the empty lounger beside me and landed several feet way under a table. The nest was 20ft up, at the end of branch, and essentially inaccessible. There was no way to return him from whence he came. And he/she/it was much too young to survive if I didn’t find a place for him/her/it. Dilemma. 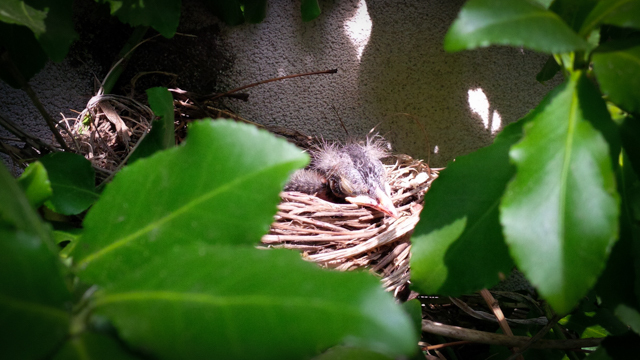 I decided to move him to another nest, in a bush growing up the back wall, which had been abandoned in the spring. That’s him in his new home in the picture above. Good news is that daddy bird heard him chirping after a few hours and started bringing him food. The bad news is that daddy seems to have forgotten the siblings in the original nest, and it has been suspiciously quite in there for a couple of days. I don’t know what else I could have done.